Three Razors Media is pleased to announce that Abigail Benge has joined our team of creative multimedia storytellers. She is working to sharpen a diverse set of business management and public relations skills this spring as the company’s inaugural Media Relations Intern. Abbie is pursuing a double major at Simpson College. She will graduate in May 2015 with Bachelor of Arts degrees in Business Management and Integrated Marketing Communications with a creative focus. She enjoys many aspects of business, communications and design, including the creation of logos, websites, web pages, blogs and other graphics and illustrations. 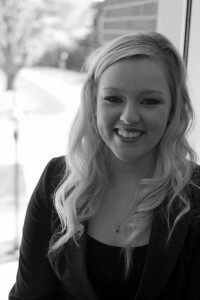 Abbie has experience in developing rapport with and providing high-quality service to her customers. This past summer, she worked as a marketing intern with Cumulus Media, and handled all aspects of various design and promotional elements for specific clients in the West Des Moines area. She is currently Station Manager and a radio voice for KSTM 88.9 The Storm, hosting a weekly radio show that covers television, film and off-campus entertainment opportunities. Abbie produces target-audience appropriate material and strives to reach new listeners while managing the more than 30 students who are involved with the station. At Three Razors, Abbie creates and aggregates compelling pieces of text, images and video – combining this timely and relevant content for use in the campaigns coordinated on behalf of the real estate marketing, construction and manufacturing organizations we serve. Her goal is to seek out and find a career in marketing, public relations, promotions or advertising. The launch of Three Razors Media's Internship Program signifies the natural next step of our desire to partner with digital natives and aspiring multimedia journalists who can bring a fresh set of eyes to the projects and campaigns undertaken on behalf of the company and some pretty awesome client organizations. Please join us in welcoming Abbie Benge. Both educational and professional development opportunities await the ambitious student reporters, journalists, marketers, or public relations practitioners we select to join the Three Razors team in the coming months and years, as the plan is to continue the program indefinitely. Learn more by composing an email with “Internship Program” in the subject line and send it along with your area of specialty to todd@threerazors.com. This entry was posted in Digital Service, Media Relations by Todd Razor. Bookmark the permalink.